We started for Bull Run on Sunday morning at 2 o’clock. The head of the column came up to a battery about 8 o’clock, and the artillery commenced throwing shell and balls into it, and in about half an hour they left it, and retreated to another. The artillery moved to the top of a hill, marked our battery. I have only marked on the map the battery which our regiment charged upon. There were eight more to the right. It was 12 o’clock before our regiment was called to charge. They were about three miles to the rear of the battery which they charged upon. They marched double quick all the way, and as it was a very hot day, you can judge what kind of shape the boys were in to fight. A great many of them could not stand it to run so far, and fell out of the ranks before they arrived at the battle ground. Our regiment went upon the main road as far as the line, marked through the cornfield and woods, and drew up in line of battle, in front of the woods. When we came out of the woods, there were a lot of rebel troops in the orchard, but as they were dressed in gray, our officers supposed they were our troops, and did not find out otherwise until they retreated some distance, turned and fired upon us, killing all that were killed during the fight. 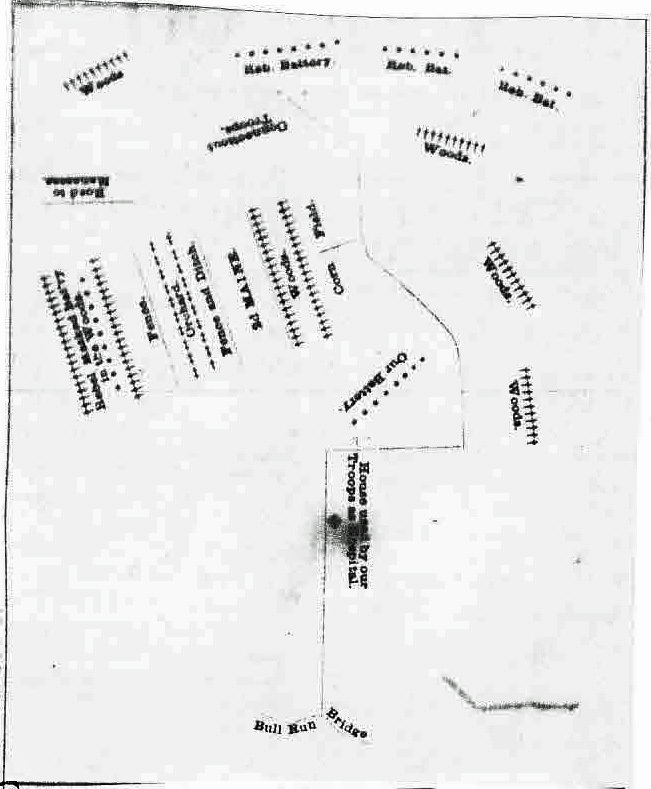 The Colonel then gave the order to charge upon them, which we did until within 40 yards of the battery, where our men stood until they were ordered to retreat by Col. Keyes. They then retreated to the woods, and laid down to rest. Gen. Tyler soon came down and ordered them to charge again, but Colonel Keyes said our regiment had done their share of fighting, and that he had better order one of the Connecticut regiments on, as they had not done any fighting. About 4 o’clock a general order to retreat to Centreville was given, as the rebels had received a reinforcement of 30,000 men from Manassas, and our troops had been fighting for eight hours and were pretty well tire out. We retreated to Centreville and encamped. About 12 o’clock at night, orders came from Gen. McDowell to retreat to Washington.